Posted 5:23 pm by Brent Ridenour & filed under Uncategorized. But the end of a soccer game is about recognizing the fans! It’s about thanking those that have come to support the players and the team and the coaches. So in reality, shouldn’t the players form a tunnel for their parents and fans to run through? Have you seen the end of a professional soccer match? Players will walk around the field and clap for the fans. After all, those fans came to support them and clap for them for 90 minutes. And at the end of the match, it’s time for the players to give that same praise back to their supporters. Parents drive us to practice. Parents drive us to games. Parents make sure that we have our cleats (tied sometimes! ), shin guards, uniforms, and ball. Parents come to support us – many times when it’s raining, windy, or even sometimes snowing! So, as a team, and as a club, let’s stop running through their tunnel and instead put the spotlight on our fans/parents with a round of applause for all that they do to support us! Posted 5:52 am by Brent Ridenour & filed under Uncategorized. Would you let your child who is in 6th grade spend TWO days each week in the 1st grade class and miss what is being taught those two days in 6th grade? I don’t know a single parent that would sign up for that. In fact, the opposite is what usually happens….a child is chosen to take a few “advanced” classes. Advanced classes = Club Soccer. Your child has the opportunity to learn at a higher level….to play at a higher level….to compete at a higher level…..you should not pass that up. And you definitely shouldn’t go back to the basics or a lower level of competition. When we ask college players when they stopped playing recreational soccer, they most popular answer is 8 or 9 years old. And they all started playing club soccer at that age and NEVER did both at the same time. Posted 8:57 pm by Brent Ridenour & filed under Uncategorized. This question usually comes from a parent of a team that is losing more than winning. Without directly saying it, they are saying that they should only play fees for winning. The answer is always the same….”You’re paying for player development.” “You’re paying for the experience of being a part of an organization that is trying to help your child become a good teammate, a good sport, and a good soccer player.” Wins or losses do not change that. The wins or losses are part of the process. Teams win, teams lose, and teams tie. But the development continues. The lessons learned continues. It doesn’t end. And no, development is not directly related to playing time in games. It’s about hard work in training, it’s about getting touches at home and in between training sessions and games. Development is about a constant process of learning and growing as a person and player. THAT is what you’re paying for. $5 for a Step Over? Posted 8:20 pm by Brent Ridenour & filed under Uncategorized. Have you heard a player say…..”if I score a goal today, my parents are going to give me $5″? A goal is something that every player has a part in, not just the one running to dance with the corner flag in celebration. What about the outside back who defended or intercepted the pass that led to our team attack? What about the central midfielder who won the last loose ball and shielding off an opponent that led to the team attack? What about the winger who did a step over and beat his/her opponent before crossing it into the goal scorer? How much should they get? Soccer is the ultimate team sport. But, parents don’t think it’s as much fun to go to the water cooler and brag about their child being a great outside back, so they want their child to be the one who scores goals so they can feel more proud. Parents should reward the same thing that the coaches reward…..hard work, teamwork, effort, being a great teammate, etc. So next time parents, let’s pick something to reward that means something in the player’s development….or just sit back and relax and enjoy watching and cheering. Posted 7:14 pm by Brent Ridenour & filed under Uncategorized. If you have been to a youth soccer practice (and maybe even a high school practice or two), you have probably seen this scenario…. Have you ever thought about why this is the soccer standard for 1) Conditioning 2) Punishment ? Soccer is not cross country. Yes, there is running. And yes, there is a considerable amount of running. But it’s not all in one direction and it’s never consistently the same pace. There is a little bit of walking or standing….followed by some jogging and then a sprint or two and then some more jogging and some more walking or standing. So it’s time to change the “conditioning/warm-up/punishment” methods in soccer. Shouldn’t coaches include the soccer ball? Couldn’t coaches develop exercises and games that 1) teach the game of soccer and 2) get players in shape? Yes! Absolutely they can and should. Our training sessions are designed to help with Soccer AND conditioning. It’s the best way to do both…playing the game is all they need. Posted 6:48 pm by Brent Ridenour & filed under Uncategorized. YES! That’s exactly what you should tell them! The goal of youth sports “should” be….development, teamwork, sportsmanship, and fun. How does winning a soccer game 15-0 help with any of those things? It doesn’t. You can develop players, teach teamwork, show great sportsmanship and have a lot of fun doing it and not run up the score. For our club, we have decided winning by 9 is enough. We believe that winning by double digits does not show great sportsmanship and it also actually hinders our player’s development. By keeping the winning margin at 9 or less, our coaches are able to 1) move players around 2) focus on teaching different parts of the game (such as passing, switching the fields, 1v1 moves, etc) 3) show the opponent that we know what it feels like. Our teams have been on the other side of the coin many many times. It’s not fun. It’s not fun to continuously pick the ball out of the net. We don’t want other teams to feel like that. Most times the other team’s coaches and/or parents will say how they appreciate that we didn’t run up the score on them. 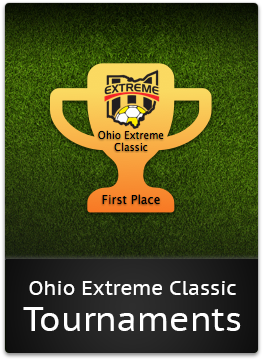 I hope the next time you see one of our teams win 9-0 you think….GREAT JOB Ohio Extreme…thank you for developing my soccer player and more importantly, thank you for teaching him/her to respect the game and respect the opponent. Posted 12:43 am by Brent Ridenour & filed under Uncategorized. It’s “Academic Week” here at Ohio Extreme SC and we really want to emphasize the importance of doing well at school. Soccer is a lot of fun, but grades and academics need to be fun also and are much important than how we do in a league game or a tournament. First, I hope that parents are taking more time focused on their child’s grades than their child’s step over. I hope that they are in contact with their child’s teacher MORE than their child’s soccer coach. Second, I hope that parents are letting their child do their own work…helping ….motivating….but also stepping back and letting them figure it out on their own. Too many times we try to do it all for them and then they don’t have a chance to learn and grow on their own. Please explain to your soccer player how important a good education is and then let them flourish. Step in from time to time and make sure they are on track. Take academics MORE seriously than soccer…..that’s true for players AND parents! We are thrilled for new locations! Posted 2:08 am by Brent Ridenour & filed under Uncategorized. “Kids America? Where is that?” I asked. Bryce Parkhill, Director of Soccer at Kids America had contacted me and asked if I would come meet with him to discuss soccer in Coshocton, Ohio, specifically at Kids America. That was August of 2017. Almost a year later, we have had several indoor soccer tournaments and now we have helped start Ohio Extreme SC in Coshocton. A big thank you to Bryce for inviting me, and also to Brian Dunlap, our new Director, for seeing the vision and trusting in our system and our process. It’s exactly how we started in Lima. A team here or there. Multiple age groups on one team. Playing in leagues and tournaments for the first time with no clue how we were going to do. Asking parents to believe in what we were doing and most importantly, why we were doing it. Asking players to try new things and watching them struggle some days and thrive on others. One thing I have not seen in Coshocton are the doubters. Lima was full of doubters. Every person I have met in Coshocton has been nothing but positive and thankful for this opportunity for their soccer players. That is so fun to be around. Thank you to everyone for opening your arms to Ohio Extreme Soccer Club and for believing and trusting in us. It is not going to happen over night. It’s going to take many years to reach the levels that we have in Lima, but with a positive group of parents, players, and coaches, we can definitely get there sooner than what we did in Lima. Year 10. Year 10? Year 10! Posted 11:03 pm by Brent Ridenour & filed under Uncategorized. It’s hard to believe that we are going to be completing Year #9 as a soccer club. It’s hard to believe that we are heading into our 10 year anniversary. But it’s also a great time to reflect and a great time to look forward. While reflecting, I think about all of the parents, the coaches, the directors, and everyone who played a part in helping us get to this level. I also think of the players that have come to training with an open mind and listened to their coaches. I wish I had saved the text messages ….the emails….and the voice mails…….you know…the ones that said “you’re never going to make it” …..”Lima can’t sustain a soccer club”……”Everyone plays 3 sports here” ……”It will never work”……”You’ll never be able to compete with the big city clubs”. 10 years ago, the biggest youth soccer accomplishment in the greater Lima area was winning the local recreational soccer league and going on to play in the “state recreational soccer tournament.” (which really isn’t a state wide tournament as it only includes the West Central and Southeastern part of Ohio). Teams/parents/coaches would walk around and brag about “Playing for the State Championship.” 10 years later….no one talks about that anymore and we now have teams that are ACTUALLY playing for the State Championship. Looking forward, I see a lot more that we can do. We are just now having teams compete on a state level (against clubs with twice as many players and with player fees far exceeding ours). We are now starting to get 2 teams at many of our youngest age groups which will be great as those teams moving into 11v11. We are continuing to form partnerships with other great youth soccer organizations across Ohio which will help us spread the word about who we are and what we do. It’s going to be an exciting future for our youngest players and I can not wait to see them improve every year. Thank you to everyone who helped us get here…..and to all of you who are going to help us get to an even higher level. Go Extreme! Posted 1:06 am by Brent Ridenour & filed under Uncategorized. As a club President for almost 10 years, I have only heard of one or two parents question training sessions and what a player is getting out of training, but we hear from 5-10 parents a year about playing time in games. At Ohio Extreme we do have “playing time” policies based on the age group of the team, but at the end of the day, our directors and coaches are all aiming at the same thing…and that’s player development. There is “some” development that occurs during games, but not as much as occurs in training and during Footskills Night. In my opinion, as a parent, I would be MUCH more concerned over how many times my child is touching the ball at training and at foot skills. Those touches are way more important than minutes played in games. In fact, I would argue that 100 minutes of “game time” equals about 10 minutes of foot skills. In school, do parents question how many “tests” a child has? Or what is being taught during the lessons? The lessons are much more important. Games are for the parents and training is for our coaches and players. We need to all try and help change that mindset.